The next-door place to visit in Delhi is Dilli Haat and why, where and what to visit in this area is completely formulated here. This open-air food complex and handicraft market are located in Delhi and operated by Delhi Tourism and Transportation Development Corporation or DTDC. The best part that this place caters is unlike a weekly market you can enjoy shopping in this market at any day of the week. Positioned opposite to INA market, this commercial market covers an area of 6 acres. The place has extensive foundation work added to it and the small thatched roof cottages and kiosks provide the complex an exotic aura that tends to attract people from all age group. In addition, there are various kinds of shops, i.e., temporary and permanent which sell goods like rosewood carvings, gems, embellished camel hide footwear, brassware, and wool fabrics. Furthermore, there is an exhibition hall in the complex that allows the promotion of handlooms and handicrafts. Dilli Haat’s stall number 12 is the Manipuri stall and holds the best of the Manipuri cuisine, probably the Erombadish. This particular dish is a mix of spicy bamboo sticks and served with fish and sauce. The list extends to many other food dishes like mutter dal, prawn pakoras, Ooti and other veggies delicacies. For two or a couple hanging out here, Rs. 500/- is the price. If you are non-veg by heart then this stall is the best suited for you. From boti to tangri, galauti to shammi, the visitors gets to enjoy a hell lot of varieties and this stall never tends to disappoint anyone visiting here. For two people, the food can be bought at Rs.450. This stall is the 90-numbered stall where the Onion Kachoris are best prepared and served. For all the Rajasthani delicacies are served here in one thali that comprises off bajra rotis with dal, garlic chutney and curry chawal with besanghatta. The stall is also best known for its sweetmeat – matkapistakulfi that is served in nice little earthen pots. The price for two people is approximately INR 500. The famous Doh Syiar Khleh, which is also called chicken salad, is best served on stall number 5, which happens to be the Meghalaya stall. Boneless chicken pieces mixed with green chilies, herbs and spices make the hanging out with friends a fun. Moreover, if you happen to be a pork lover then a special dish is served for such people. Wak Bijak is the name of that special dish, boiled and served with bamboo shoots. For fried pork, you need to try Dohshianey Salieh that comes along with red chilies and tends to make the dish a spicy affair. The price for two would be INR 500 here. Oh! This is the most preferred stall, especially famous for serving momos. Now those who are the diehard lovers of this steamed beauty, they yes, this stall is specially meant for you. The number for this stall is 6 and is from Arunachal Pradesh. In addition, not t miss is the Thupkas, which is a delicious dish, made out f noodles and veggies or chicken, depending on the demand of the person. With a lime beer, this dish tends to take you to the next level of enjoyment. The price tagged for two people here is Rs. 400. 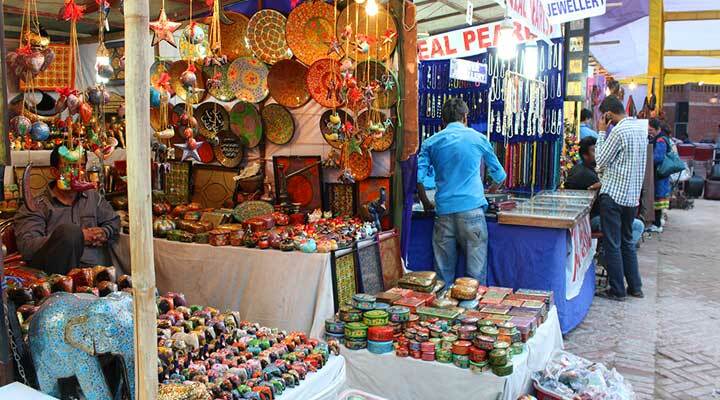 Now many such stalls make Dilli Haat a versatile place to visit and enjoy special with your friends. Moreover, the place also enjoys an ample amount of connectivity like the INA metro station just hundred meters away from the location of the complex. In addition, one can use the DTC buses to reach here from any part of the Delhi. Not just this, the place is the best example of naturally cleaned and maintained complexes. In total, there are three options available for Dilli Haat in Delhi that one can enjoy visiting, namely, in INA, in Pitampura, and in Janakpuri. So not only just you can visit the one in South Delhi but also at many other places. All the other options have convenient metro connectivity that makes them easy to reach. The conclusion for this place can specifically point to one and only fact that meeting here with friends is always fun.